Spoken word – a performance-based form of poetry – has increasingly come to define contemporary poetry worldwide, rapidly becoming a booming industry and a widespread culture across the U.S., Europe and here in South Africa. However, in the era of information and globalisation, there are those who pessimistically fear for the lifeblood of unique, indigenous South African literature. 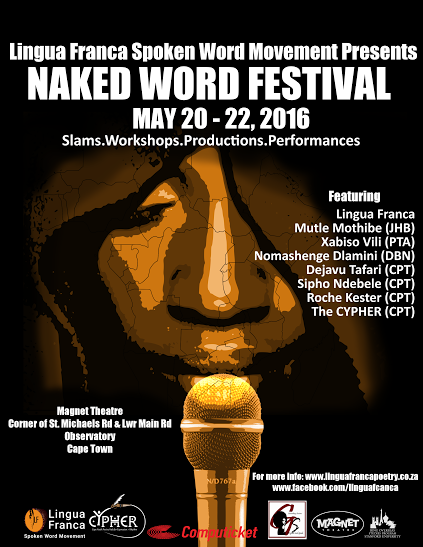 This 20th-22nd May 2016 at the Magnet Theatre, the Lingua Franca Spoken Word Movement – one of Cape Town’s premier poetry collectives – will demonstrate otherwise by organising the Western Cape’s first and only festival dedicated purely to spoken word. The Naked Word Festival will serve as an affirmation, a declaration and an exploration of the future of a distinctly South African poetry. This festival will celebrate a new century of spoken word poets actively redefining South African literature, in both its oral and written forms, by highlighting young poets from different cities, backgrounds and cultures who are pushing the boundaries towards a new language, sound and aesthetic that expresses and reflects our current realities, struggles, and bare truths. In stripping away any and all adornments and superficiality, the Naked Word Festival will seek to uncover and rediscover contemporary South Africa poetry in its most raw and essence. The Lingua Franca Spoken Word Movement, with its unique signature fusion of spoken word poetry and authentically South African music, has been a leading inspiration to the growing spoken word community in Cape Town for over three years. They have performed original poetry productions in various spaces across Cape Town, including the Baxter Theatre, Artscape Theatre, Magnet Theatre, Delft Rent Office, and Alexander Bar’s Upstairs Theatre, gaining critical acclaim and a passionate following. Lingua Franca’s collective consists of such innovative, multidimensional resident artists as Mbongeni Nomkonwana, Lwanda Sindaphi, Koleka Putuma, Anele Kose, Babalwa Makwethu, Khanyiso Mabodla, Javier Perez, and Zama Qambi. The Naked Word Festival officially opens on the 20th May, but includes a teaser on the 19th with a collaboration with existing weekly poetry platform, Grounding Sessions, which will feature Mutle Mothibe and Nomashenge Dlamini along with an open mic. Festival attendees will see performances by a range of top local and national artists, including the widely-celebrated Johannesburg-based poets, Mutle Mothibe and Xabiso Vili, who have gained critical prominence in the national poetry scene, as well as Durban-based, Nomashenge Dlamini. Also featuring are the Cape Town-based heavy-hitters, Dejavu Tafari, Sipho Ndebele, and Roche Kester. The festival will also showcase the Cape Youth Poetry Hub for Expression & Rhythm (CYPHER), a collective of youth poets (ages 15-20) who are currently marking a new chapter in South African poetry. The Naked Word Festival will serve as a platform for a younger generation to demonstrate that South Africa’s young artists possess an undeniably transformative voice capable of being catalysts and drivers of social change. All who attend can expect an unparalleled experience of South African art at its finest. For more information about the Naked Word Festival click here or engage on Facebook and Twitter.